The 2019 event takes place on Sunday 1st September, starting at 9am (8am for Hilly Billy Challenge runners) from Creasey Park Community Football Centre in Dunstable. You can find the venue on here Google Maps. You will receive some important information in your confirmation email when you sign up. Please take some time to read it. If you haven’t received the email, the information is here. Please do not attempt to park in the main Creasey Park Football Centre car park. Marshalls will be available to direct you to the overflow car park off Brewers Hill Road and the Council car parks accessible via N Station Way, all of which are marked on the map below. 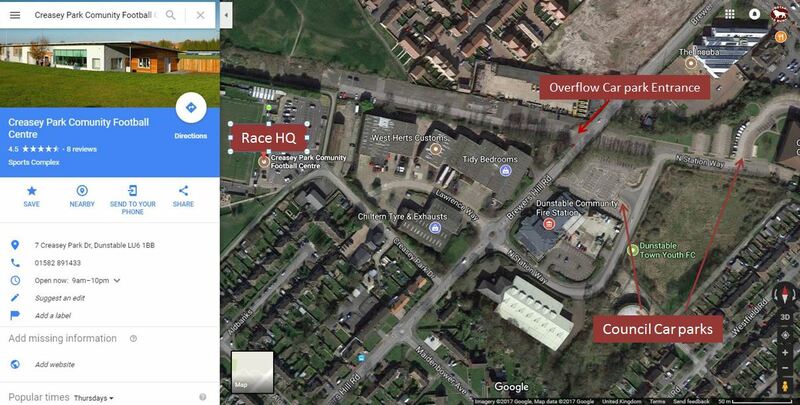 Please note if you park in the Overflow car park, there is a pedestrian gate at the opposite end to the entrance for easy access to Race HQ. All runners need to collect their numbers from Race HQ at Creasey Park Community Football Centre on the morning of the race. Registration desk opens at 7:45am (7:15am for Hilly Billy Challenge runners). We do not issue numbers or race packs in advance as due to the nature of this race it’s essential we know exactly who is out on the course on the day. If you are no longer able to run in the event, we can process refunds up to 7 days before race day. If you would like to defer your place to next year, we can do this up to midday on the day before the race. Please contact us if you would like a refund or deferral. Unfortunately we will be unable to process any requests made after these times. There are changing facilities and showers located within Creasey Park Football Centre which all runners are free to use. We provide a large spread of refreshments including sandwiches, cakes, teas & coffees including some Vegan and Gluten Free options.